With the accession of George V to the British throne in 1910, it became necessary for the Royal Mint in London to produce a set of master tools for the obverse of the new Canadian coins. For the first time the regal portrait for the coins was produced by an artist outside the Mint. The eminent Australian sculptor, E. Bertram MacKennal, was commissioned to provide the model from which the obverses of all the coins for Britain and the colonies were derived. 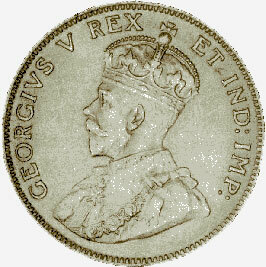 MacKennal's fine work can be seen on the 1911 Canadian 25-cent piece shown. His initials B.M. are at the bottom of the shoulder. The legends on previous Canadian decimal coins had always contained the Latin DEI GRATIA following the British monarch's name signifying that he or she ruled by the grace of God, but this phrase was omitted from the 1911 Canadian obverses. This led to a public outcry that the new coins were "graceless" or "Godless" and the legend was hurriedly altered for the next year's coins. This coin is part of the National Currency Collection, Bank of Canada.